Camerata at Paulie’s, 13 Celsius and Public Services Wine & Whisky are joining forces to celebrate the start of the Basque cider season with a series of events called “¡Txotx!” (pronounced “choach”). That’s the exclamation of a cider house owner to alert his guests that he’s about to tap a barrel and to gather around to fill their glasses. From Thursday, January 19 through Sunday, January 22, all three participating bars will channel the spirits of the sagardotegias, or Basque cider houses that, as a centuries-long tradition, throw open the doors to the fermentation rooms and invite guests to dine and drink freshly fermented cider straight from the casks. The bars will all feature hard cider (“sidra” in Spanish), txakoli (dry sparkling white wines) and selections from Rioja Alavesa, a region known for its spicy red tempranillo. Camerata is also adding traditional pintxos (snacks) by chef Erin Smith Feges to the food menu and offering curated flights of sidra and wine. (Fun fact: “pintxos” is the Basque spelling of pincho, which means “to pierce,” so expect small bites on skewers or toothpicks.) Smith says the menu includes Pinxtos Gilda (pepper, olive and anchovy skewers), Tortilla Espanola (potato omelet), eggplant caponata crostini, guanciale-wrapped dates stuffed with bleu cheese and walnuts, and a Spanish meat and cheese board. The Basque region is an area that runs from Northern Spain and extends into the southeastern corner of France. Hard ciders from this region are much drier (and therefore less sweet) than those produced in the United States and other parts of Europe. There is no added sugar or carbonation, so it’s poured from a height of at least meter from a barrel or, on a smaller scale, from a glass vessel with a narrow spout called a porrón. It’s called “throwing the cider” and while it’s stylish and showy, it also serves a purpose: to aerate the cider, which breaks up the natural carbonic gas, adds oxygen and releases the aromas and flavors. Porrón Pouring Competition, Thursday, January 19, 10 p.m.: This kick-off event has an industry-friendly start time to allow professionals to head over after work. The entry fee is $15 for one- or two-person teams. Contestants will be judged on knowledge as well as the difficulty, creativity and execution of their pours. The judges are David Buehrer of Greenway Coffee (and others), sommelier Brandon Kerne of Pappas Bros. Steakhouse and Phaedra Cook of Houston Food Finder (aka “yours truly”). Basque Beverage Seminar, Saturday, January 21, 1 p.m.: Camerata general manager Chris Poldoian is speaking on the traditions and characteristics of Basque ciders and wines. The cost is $50 and ten different ciders (or “sidra” in Spanish) and wines will be tasted. 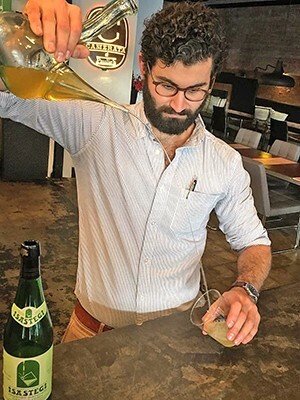 Poldoian says, “The goal of Txotx is to foster a long-term appreciation of Basque wines and ciders within the Houston community.” In other words, it’s an opportunity to drink, have fun and gain cultural knowledge in the process: a win-win-win situation.